What does the Y capacitor in a SMPS do? It seems that a well-designed SMPS has a capacitor connecting the ground planes of the primary and secondary sides of the transformer, such as the C13 capacitor here. What is the purpose of this capacitor? I've let myself understand that it's for EMI suppression, but what kind of EMI does it suppress, and how? It seems to me to be the only leg of an open circuit and thus completely inert, but obviously I'm wrong about that. Switched mode power supplies use what is known as a "flyback converter" to provide voltage conversion and galvanic isolation. A core component of this converter is a high frequency transformer. Practical transformers have some stray capacitance between primary and secondary windings. This capacitance interacts with the switching operation of the converter. If there is no other connection between input and output this will result in a high frequency voltage between the output and input. This is really bad from an EMC perspective. The cables from the power brick are now essentially acting as an antenna transmitting the high frequency generated by the switching process. To suppress the high frequency common mode is is necessary to put capacitors between the input and output side of the power supply with a capacitance substantially higher than the capacitance in the flyback transformer. This effectively shorts out the high frequency and prevents it escaping from the device. When desinging a class 2 (unearthed) PSU we have no choice but to connect these capacitors to the input "live" and/or "neutral". Since most of the world doesn't enforce polarity on unearthed sockets we have to assume that either or both of the "live" and "neutral" terminals may be at a sinificant voltage relative to earth and we usually end up with a symmetrical design as a "least bad option". That is why if you measure the output of a class 2 PSU relative to mains earth with a high impedance meter you will usually see around half the mains voltage. That means on a class 2 PSU we have a difficult tradeoff between safety and EMC. Making the capacitors bigger improves EMC but also results in higher "touch current" (the current that will flow through someone or something who touches the output of the PSU and mains earth). This tradeoff becomes more problematic as the PSU gets bigger (and hence the stray capacitance in the transformer gets bigger). On a class 1 (earthed) PSU we can use the mains earth as a barrier between input and output either by connecting the output to mains earth (as is common in desktop PC PSUs) or by using two capacitors, one from the output to mains earth and one from mains earth to the input (this is what most laptop power bricks do). This avoids the touch current problem while still providing a high frequency path to control EMC. Short circuit failure of these capacitors would be very bad. In a class 1 PSU failure of the capacitor between the mains supply and mains earth would mean a short to earth, (equivalent to a failure of "basic" insulation). This is bad but if the earthing system is functional it shouldn't be a major direct hazard to users. In a class 2 PSU a failure of the capacitor is much worse, it would mean a direct and serious safety hazard to the user (equivilent to a failure or "double" or "reinforced" insulation). To prevent hazards to the user the capacitors must be designed so that short circuit failure is very unlikely. So special capacitors are used for this purpose. These capacitors are known as "Y capacitors" (X capacitors on the other hand are used between mains live and mains neutral). There are two main subtypes of "Y capacitor", "Y1" and "Y2" (with Y1 being the higher rated type). In general Y1 capacitors are used in class 2 equipment while Y2 capacitors are used in class 1 equipment. 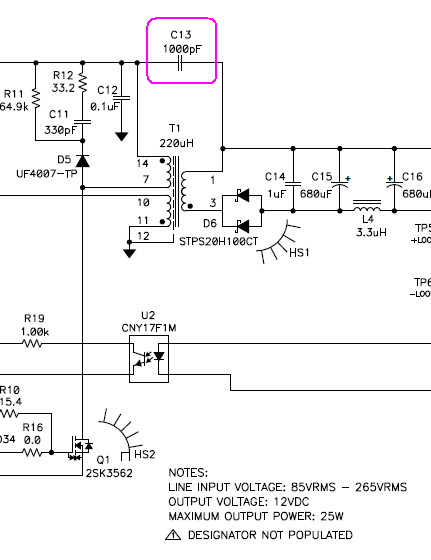 So does that capacitor between the primary and secondary sides of the SMPS mean that the output is not isolated? I've seen lab supplies that can be connected in series to make double the voltage. How do they do that if it isn't isolated? Some power supplies have their outputs hard-connected to earth. Obviously you can't take a pair of power supplies that have the same output terminal hard-connected to earth and put them in series. Other power supplies only have capactive coupling from the output to either the input or to mains earth. These can be connected in series since capacitors block DC. In my experience as an electronic engineer I have found quite a lot of professional class II power supplies have a leakage of around 80v AC to ground due to the presence of the Y capacitor. The IEE permits a leakage current of <85uA for non-medical equipment. It can however cause problems with audio circuits. I've seen a few instances of ground-loop hum when a laptop is connected to an audio amplifier or when on-stage effects are connected to a PA. I personally have experienced a mild but unpleasant shock from a microphone due to the leakage from a SMPS. My initial solution was to remove the Y capacitors and fit a ground connection but I eventually built my own linear PSU's using a toroidal. As far as "stacking" is concerned I once had a case with a medical trolley in a hospital comprising of several class II medical-grade SMPS's connected to various instruments which had failed the (stricter) hospital earth current touch test due to the combined leakage current. To directly answer OP's question; the use of Y capacitors, while conforming to standard engineering practice in the past, should probably be avoided in new designs. A new engineering tradeoff for the use of Y capacitors has emerged within the last decade or so, due to NEC (US National Electric Code) requirements for use of GFCI and AFCI circuit breakers. These breakers are designed to trip at 5 mA total ground current for all AC outlets on a branch circuit. Obviously, allowing 3.5 mA per class I device adds up pretty quickly for a typical living room entertainment center or computer workstation. While current leakage standards allow this, OEM's are getting more and more consumer complaints that their product "trips my breaker, I want it fixed" https://www.fluke.com/en-us/learn/blog/grounding/chasing-ghost-trips-in-gfci-protected-circuits. The NEC requirements have been increasing over the last decade, and many States and Cities are only now fully incorporating it. While class II devices (no third grounding prong on AC plug) have more stringent leakage specs, they are the solution most designers seem to be moving towards; these devices are able to meet EMI specs with no Y capacitors at all. Not the answer you're looking for? Browse other questions tagged switch-mode-power-supply emc or ask your own question. Purpose of capacitor across transformer in AC-DC power supply? How can I get shocks while charging my phone in the train? How to solve electric shock issues in this system? Prickling sensation in feet while near electric cables - should I worry about this? ATX power supply front-end: How does this work? Why did this designer decouple to PE-ground? Interleaving in litz wire transformer - to be or not to be?